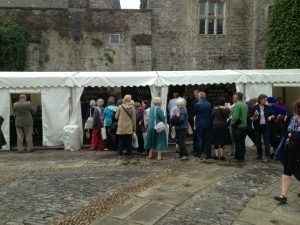 Jenny Balfour Pau l was a featured speaker at the 2015 Ways With Words Festival of Words and Ideas at Dartington, Devon. Her illustrated talk, ‘Missing Pieces’, evocatively described how her life’s fascination with Indigo led to a deeply personal quest to unpick the life of a forgotten Victorian mariner, indigo planter and explorer, Thomas Machell, which resulted in her widely reviewed and acclaimed book Deeper Than Indigo. 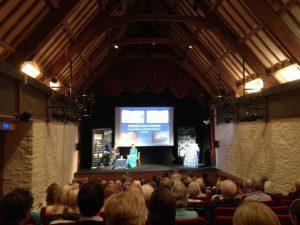 Andy Christian, writer, curator, former managing director of Dartington Hall Trading Company and Vice President of the Devon Guild of Craftsmen chaired the popular session on Sunday 12 July in Dartington’s magnificent Barn theatre. Using Machell’s colour sketches and her own watercolours and photographs, Balfour Paul transported the audience to the exotic places she explored in the footsteps of Thomas Machell (and often the footsteps of her own younger self too). These includ ed Indigo and coffee plantations in Bengal and Kerala, China during the Opium wars, the pirate coasts of Arabia and the remote Polynesian Marquesas Islands in the southern Pacific, where Machell fell in love with a cannibal chief’s daughter (and where she confessed to falling for a handsome tattooed local sailor 150 years later). Balfour Paul explained that: “Without the word ‘Indigo’ I would never have found the forgotten five journals and embarked on a ten year journey in which I got to know Thomas better and better.”Dartington’s Ways With Words 2015 Festival featured ten days of international speakers, including Ben Okri, Karen Armstrong, Penelope Lively, Michael Buerk, George Monbiot and A.C. Grayling.